You would be forgiven for thinking the current craze for stripped down street bikes is a recent phenomenon. Pop into your local dealer tomorrow and you will have your pick of just about any engine configuration from every manufacturer when it comes to a naked bike with big flat bars. The choice is downright confusing to say the least, baffling to be more accurate. But the truth of the matter is that street bikes have been around for ages, it’s just in the last few years that the concept has gained a degree of momentum. 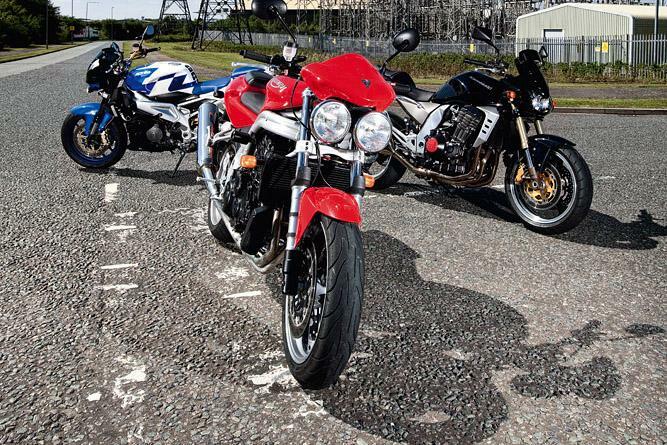 Which is great news for the secondhand buyer as it means that the used market is starting to fill up with brilliant examples of early street bikes. And best of all the secondhand choice is no less varied than that of the new machinery. We looked through the dealer ads to find our pick of the bunch with a price tag around the £4,500 area and then added an extra constraint to spice things up; none were to have the same engine configuration. With this in mind we uncovered a 2004 Speed Triple with a screen price of £4,300, a truly classic street bike and the model before Triumph went all ‘funky’ with the looks. A 2004 Kawasaki Z1000 for £4,300, arguably the first of the Japanese inline four street bikes that brought styling as well as versatility to the table and finally a 2006 Aprilia Tuono. Although this bike was priced at a touch under £5,000, when buying a secondhand Tuono it is far better to pay a bit more and get this model as it is the first of the updated generation of Tuono and is a superior bike to the original version. So, with our three bikes selected we headed onto the twisty and undulating back roads on the hottest day of the year to sample some naked tomfoolery. Why restore as standard when you can do this?